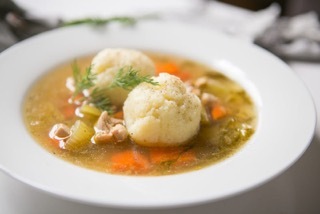 Mimi’s Matzo Ball Soup Program comes to Queens! Our Queens’ students are truly blessed! In time for the Jewish New Year, Queens University of Charlotte’s Hillel is proud to present Mimi’s Matzo Ball Soup! Multiple times a year, students and staff on campus will be able to find comfort and relieve stress in the traditional Jewish way — with a cup of homemade matzo ball soup “Mimi style”. Patty Karro Gorelick (lovingly called “Mimi” by her grandchildren) was a lady of great taste, kindness and intellect, as well as a fashion icon, and a President of Queens University’s Learning Society. She cared deeply for and nurtured well her family and the many communities of which she was a part. The Mimi’s Matzo Ball Soup program is a gift from the Gorelick family to honor Patty and infuse Queens’ campus with the love, warmth, and wisdom Mimi/Patty shared with all who were fortunate to know her. It is a great way for our Hillel students to share a piece of our Jewish culture while creating lasting positive memories of matzo ball soup for our diverse student body.